Please read the Spirit Week Guidelines. 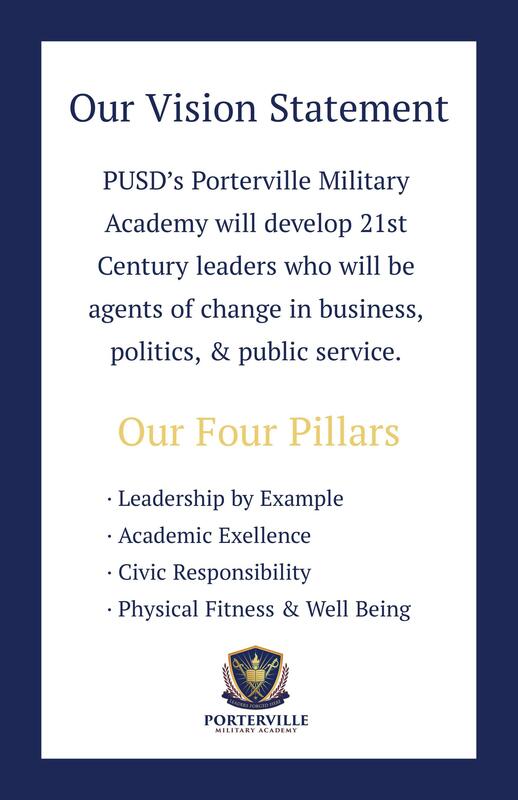 Bakersfield ABC Channel 23 feature on the new addition for the Porterville Military Academy. Click on file link above. 2019/2020 ENROLLMENT IS NOW OPEN! Only 60 slots are available for 7th grade and 10 slots have been filled already. There will be a few slots in grades 8th, 9th, and 10th. Family of current cadets have priority as long as a completed application is submitted. See the link for the online application or come to the PMA front desk for a paper application. 👩🏼‍💻👨🏾‍💻 For our PMA Parents & Guardians who are already signed up for our Aeries Parent Portal but would like to receive weekly grade reports sent directly to their email: 1️⃣ Log into Aeries 2️⃣ On the upper right-hand scroll below your email address 3️⃣ Select Parent Notification Preferences 4️⃣ Select & save the day of the week and time you would like to receive via email your Cadet's up to date grades Contact Ms. Reyes (PMA Assistant Principal) for further support at nreyes@portervilleschools.org or 782-7300 ext. 7396. One Team, One Fight! To sign up for our Aeries Parent Portal open up the attached Google Slides which goes over the steps. Once you sign up, you will be able to view your Cadet's grades, missing assignments, attendance, etc. You will also need your Cadet's Student ID, primary contact phone number on Aeries, and their 10 digit Verification Code. Please feel free to contact me Ms. Reyes (PMA Assistant Principal) for further information on how to sign up. You can reach me at nreyes@portervilleschools.org or at 782-7300 ext. 7396. Cadets will now wear their PT uniforms every Wednesday instead of their Class C.